From CBS to NPR to CNN - International Ethics Speaker and Author, Chuck Gallagher shares insights on Ethics! Far from boring, Gallagher deals with the "Why" ethics fail and "How" to prevent ethics lapses! You may have seen Chuck on television, or heard him on CNN, CBS or NPR radio programs. His business insights are sought after for his strong position on ethics and sales leadership. Chuck Gallagher's focus is business � but his passion is empowering others. His unique presentations, from Expert Sales Training to Effective Business Ethics clearly demonstrate he brings something to the platform that isn�t often found in typical business speakers. Chuck's personal experience in building businesses and sales teams while leading companies provides a practical and powerful framework for success. Currently COO of a National Company and former Sr. VP of Sales and Marketing for a Public Company, Chuck may have found a sales niche early on in life selling potholders door to door, or convincing folks to fund a record album of his musical performance at age 16 (and yes those were the days when an album was made of vinyl), but it was the school of hard knocks that provided a fertile training ground for Chuck's lessons in Success. Described as Creative, Insightful, Captivating, and a person that "Connects the Dots" between behavior, choices and success, Chuck Gallagher gives his clients what they need to turn concepts into actions and actions into results. In the middle of a rising career, Gallagher lost everything because he made some bad choices. He has since rebuilt his career and his life back to immense success. With more vulnerability than the average keynoter, Gallagher shares with his audiences his life journey, the consequences of his unethical choices, and how life gives you second chances when you make the right choices. In fact, Gallagher's new book - SECOND CHANCES: Transforming Adversity into Opportunity - has received numerous endorsements and has been described as one of those rare books that effectively bridges the gap between personal accountability and business success. With Chuck you have an industry professional sharing practical tested and time proven methods that can enhance personal and professional performance. What Chuck shares in his presentations - whether training, keynotes or executive coaching - are understandings of not only "How To", but also "what motivates behavior" - behavior of individuals which create personal and professional success. On a nationwide basis, Chuck has helped countless individuals on their Journey to Success! So here's the question - Do you want your personal performance or your company's performance to improve? If so, Chuck offers a "real world" practical approach to improving your understanding of how to achieve "Second Chances"! Now is the time to book Chuck and take the steps needed to improve yourself and grow your business thereby achieving your success...! And yes...Chuck's programs are GREAT FUN! He'll have your audience asking for more and knowing that what is discussed today will yield results tomorrow! 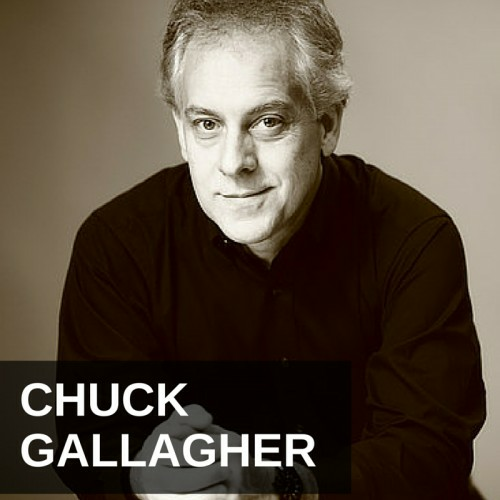 Find out more about Chuck Gallaghaer at http://www.chuckgallagher.com.